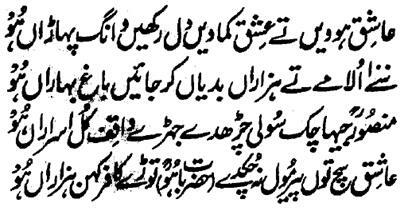 Hazrat Sultan Bahu Rahmatu-Allahe Ta-aala Alaihe says that 'that person, who happens to be the Seeker and Aashiq of the Real beloved Allah Almighty, he should be strong as mountains are and should have courage as lofty as skies are as in the thorny terrain of the Destination of Ishq and the Station of Muhabbat, one has to face severe hardships and countless problems. Hence, he should keep on going ahead taking all thorns of the Course of Muhabbat as flowers and roses because there exist some rivals and foes of the virtual beloved but, on the Course of the Beloved of the Azal and the Real beloved , there exist multiple thousands foes and rivals and one has to encounter the evil and enmity of all. Further, he should not gasp on this Course lacking the necessary guts and should not expose the Secret of the Mashooq because Mansoor, though, was the Privy (and Insider) of the Secret of Lord , but, he became convicted for trial and was hanged till death upon his gasping 'Ana-Al-Haq' (I am the Conceived Truth) . Hence, the Aashiq should confide his cause unto Allah submissively. Although the stupid and unwise people may call him bad and Kaafir, he remains steadfast (and persistent) on the Haq and the Right.